SARRC’s Annual Community Breakfast is one of the Valley’s premier outreach and fundraising events. Funds raised during this signature SARRC event go directly back to our innovative programs, services and research initiatives. 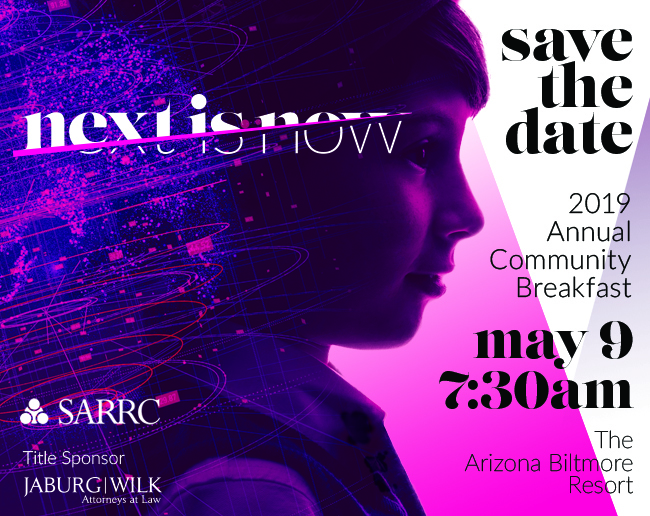 Join Southwest Autism Research & Resource Center for the Annual Community Breakfast scheduled for Thursday, May 9, 2019 at the beautiful Arizona Biltmore! Register by Thursday, April 25. This year’s theme, Next is Now, emphasizes how SARRC’s entrepreneurial approach to developing what’s next for people with autism is now helping them more meaningfully integrate into inclusive communities. We’ll share our latest achievements, exciting plans for what’s next for SARRC’s future, and how you can help us now. ​There is no cost to attend the Community Breakfast. The event is underwritten by our generous sponsors, so every dollar raised during the Community Breakfast goes directly back to SARRC's programs and services. We encourage our guests to arrive early for a quick check-in and the chance to network! Take a Lyft and enjoy 20% off your ride to and from the Arizona Biltmore on May 9! To take advantage of this great offer enter promo code SARRC19 while ordering your ride using the Lyft mobile app. The Fielder Family Opens a New Window. Opens a New Window. Opens a New Window. Arizona Complete Health Opens a New Window. Arizona Diamondbacks Opens a New Window. Arizona Residential Architects Opens a New Window. Arizona State University Opens a New Window. Colliers International Opens a New Window. Cox Communications Opens a New Window. Dentons Opens a New Window. Dogtopia Opens a New Window. Genentech Opens a New Window. GOVIG & Associates Opens a New Window. Melmed Center Opens a New Window. MFRG-Icon Construction Opens a New Window. Nathan & Associates, Inc. Opens a New Window. Riester Opens a New Window. SMS Financial, LLC Opens a New Window. Sprouts H Opens a New Window. Opens a New Window. ealthy Communities Foundation Opens a New Window. SSP America Opens a New Window. UnitedHealthcare Plan Opens a New Window. U.S. Bank Opens a New Window. USI Insurance Services Opens a New Window. VanTrust Real Estate Opens a New Window. Wells Fargo Opens a New Window. Zynerba PharmaceuticalsOpens a New Window. Advisor Group Opens a New Window. Arbor Medical Partners Opens a New Window. Arizona Garage & Closet Design Opens a New Window. Barrow Neurological Institute Opens a New Window. Beus Gilbert PLLC Opens a New Window. Brown & Brown Insurance Opens a New Window. /CopperPoint Insurance Companies Opens a New Window. Centria Autism Opens a New Window. Desert Institute for Spine Care Opens a New Window. Opens a New Window. Opens a New Window. Emily R. Taylor, Attorney PLLC Opens a New Window. Fiesta Bowl Charities Opens a New Window. Henry & Horne Opens a New Window. Hensley Beverage Company Opens a New Window. My Sister's Closet Opens a New Window. Phoenix Children's Hospital Opens a New Window. Regional Center For Border Health, Inc. Opens a New Window. Southwest Gas Opens a New Window. Corporation Opens a New Window. U.S. Trust Opens a New Window. A one-of-a-kind Community Breakfast sponsorship is a testament to your company’s commitment to SARRC’s mission and underwrite the cost of this important fundraising event. We also welcome sponsors to join us the morning of the Breakfast by hosting a table. Table Captains are essential to the success of the Community Breakfast. By hosting a table, Captains connect us with community members who are passionate about autism, help us increase awareness and educate our community. Interested in becoming a Table Captain? Contact us to learn more! Current Table Captains: Download your digital Toolkit here Opens a New Window. .